EASyM was initiated as part of the FP7-funded Coordinating Action Systems Medicine (CASyM, www.casym.eu). CASyM defined a first road map for implementing the Systems Biology approach within medical research and practice. CASyM-based activities have revealed a strong interest in Europe across sectors and disciplines in the value of Systems Medicine for European healthcare. 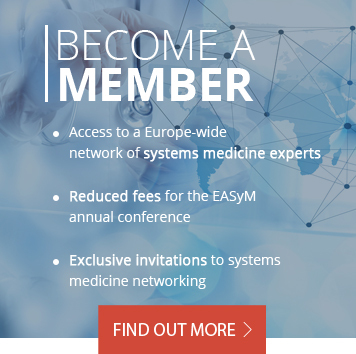 EASyM will take on the legacy of CASyM, including the preservation, application and expanding of resources build up by CASyM and will continue CASyM’s long-term vision of establishing systems medicine-based practices in European healthcare. EASyM was founded on 30th September 2015 in Brussels by 27 medical doctors, researchers and health care stakeholders from 12 different countries. On that date, an Executive Board of 7 members was also elected (details about Executive Board click ). EASyM was officially registered in Aachen, Germany (which borders to both Belgium and the Netherlands) on 18th March 2016. Due to its charitable status, it is exempted from corporate tax. As an independent organisation, it is able to receive sponsorship and donations for the advancement of personalised and systems medicine.